It’s hard to imagine living in a world without GPS. From handheld devices that globally navigate us, to satellite atomic clocks synchronizing our time, we rely heavily on GPS in modern civilization. What was once a tool developed by the US Navy to locate submarines, today’s abundance of satellites in orbit and advancements in technology have granted GPS access to anyone willing to wield it. 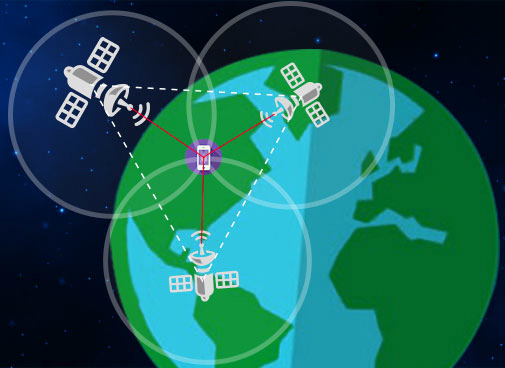 With over thirty GPS satellites in orbit, a person standing anywhere on the planet will have at least four satellites “visible” to them at all times. Each satellite transmits information about its exact position at light speed, which can be received instantly by anyone with a GPS receiver. However, knowing the position of one satellite is not too helpful for determining a person’s own location, which is why having four satellites are! Though the process of triangulation, a person can calculate their own position by only knowing the positions of at least three other satellites. You can read more about how this works here! From tracking automobiles in a rideshare app to geologging the life’s journey of a bald eagle, GPS is an incredibly powerful tool and we’re going to show you just how easy it is to implement a GPS receiver of your own. In this article, we’re going to show you how to add GPS capabilities to a Raspberry Pi project with a few pieces of hardware and PubNub. Not only will you learn some basics of IoT programming, but also learn how IoT data can easily be handled with PubNub’s robust Data Stream Network and APIs! You’ll notice that none of the pins are attached on your GPS module. In order to easily connect wires to our module and RPI, we’ll need to solder the pins on with our trusty soldering iron. Break off 9 of the pins you see on the left and insert them (short side first) into the top of the board (the side with the pin labels) and solder the pins to the board. Above is what two pins look like properly soldered and below is all the pins soldered on. NOTE: If you don’t know how to solder, watch this video and proceed carefully. You can severely burn yourself soldering. Since we are using a Raspberry Pi with this GPS module, we’ll need to have access to the Raspberry Pi’s UART (Universal Asynchronous Receiver Transmitter) interface. The details of why we’re using this protocol extend far beyond the scope of this project. In essence, this is the best way to send and receive data serially from our module to the RPI. The TX (transmitter) pin of the GPS module sends bits to the RX (receiver) pin of the RPI and vice versa. You can read more about it here and even more about it here. Quick Disclaimer: The next few sections require setting up the Raspberry Pi with various libraries and drivers so that we can properly establish communication with the GPS module. This may get confusing for some who are not familiar with IoT or embedded system programming, but don’t give up! I guarantee you’ll make it out alive! NOTE: Be sure to have SSH enabled on your RPI before you jump into the mess. You can learn how to do so here. NOTE: Also make sure you sign up for a free PubNub account before you begin! You’ll need your own pub/sub keys to make it work. If you want to be able to have your Raspberry Pi have GPS capabilities without WiFi dependance, then you’ll need to use an LTE shield. The setup for this is fairly simple and you’ll need to go to this page for the setup. Once you’re on the page, carefully follow the “Hardware Setup” as well as the “Software Setup” instruction sections. Here you will essentially download the necessary libraries, packages, and GitHub repositories to run SIXFAB’s software on the hardware. Lastly, follow the “Autoconnect on Reboot” section to make sure you’re RPI connects to LTE on startup. You should then get a graphical interface in your terminal. Select the menu options highlighted in red. This step is required to use the CircuitPython Library in Step 4 as many of the I2C drivers are used in that library. This is essentially a 2-wire bus protocol that allows one chip to talk with another. Please reference this page if you’re interested in learning more about bus protocols. SPI (Serial Peripheral Interface) is another bus protocol that synchronizes serial communication between chips. Again, for those interested in learning more, check out this Wiki page. Navigate through the menu interface by selecting the options highlighted in red. To make sure we did the previous steps correctly, we are going to run a test script on our RPI to verify we have all the necessary hardware protocols enabled. NOTE: Be sure you have python3 and pip3 commands installed on your device before you continue! Install the Raspberry Pi GPIO Library. Now install the library for our test script. Now create the test script named blinkatest.py with nano. Copy and paste this code into the test script and save. You should get an output like this. If not, go back and re-do the corresponding step to your failed tests. CircuitPython is Adafruit Technology’s programming language that aims to “simplify experimenting and learning to program on low-cost microcontroller boards.” Therefore, this is the best tool to quickly and easily run example programs of their various products so we’re simplifying this page’s installation instructions. If you haven’t done so already, ssh into your RPI and cd into your project’s directory. In your project directory, clone this repository. To be safe, cd into the library you just cloned and then clone the GPS python library. In order to make sure we have done everything correctly (in both hardware and software setup), let’s run an example script in the circuitpython-gps library you cloned. Locate and comment out the following lines to make sure the program runs smoothly with our RPI. Then locate and UNcomment these lines. Then change the 2nd line you just uncommented to this. Now you should be all set to run the code. Make sure your GPS module has a clear view of the sky and run the code! If you haven’t already done so, sign up for a free PubNub account before you begin this step. Instead of creating a whole new file from scratch, we’re going to ease the coding process by making just a few modifications to the gps_simpletest.py file we tested earlier. You can pick any of the example tests (or write your own from scratch), but it’s always better to start from a template. cd into the examples directory containing the gps_simpletest.py file and install the PubNub Python SDK. Configure a PubNub instance with your publish/subscribe keys. Then to publish, place a publishing callback somewhere near the beginning of your code. You can write whatever you want for the callback, but we’ll leave it blank as we don’t really need it for now. Here is where you decide what data you want to publish. Since we are building just a simple GPS tracking device, we’re just going to be dealing with the latitude and longitude coordinates. It is best to place the dictionary and publishing lines within the “if gps.DATA is not none” to avoid any program failures. I hope we can all appreciate how far we’ve come so far because we’re about to see it all come together. The last step of this journey is to visualize our GPS data in a way that humans can understand. We’re just going to create a small HTML page that will grab GPS data from our PubNub channel and graph the data with a mapping API. The Google Maps API is a universal tool that is not only one of the cheaper APIs for a greater amount of API calls but also has a rich and expansive toolset for developers. The GPS data is not only more accurate than most other APIs, but also has extensive tools such as “ETA” that uses Google’s geographical terrain data. So if you ever want to build a serious GPS tracking app with PubNub, Google Maps is the way to go. Once that’s done, create an .html file and copy-paste the code below (explanation of the code is below as well). This part of the code is responsible for rendering our map on the HTML page. NOTE: The rest of the code is encapsulated within one script tag, so don’t be alarmed if we jump around in explaining this final part of the code. Then we instantiate a PubNub listener with the following code. In order to avoid syntax errors, place a subscriber instance right below the listener. As you can see, we open up incoming messages with the following line of code. And then extract the variables we desire based on the sent JSON. We then format the data variables in accordance to a Google Maps object. To set a Google marker on our GPS coordinates we create a Google Maps marker object. Then add the marker to your Google Maps object by calling setMap(). Of course, it would be nice to center our map on the marker so we can actually see it so we center it on the markers position. This is optional, but if you want to add a smooth zooming animation every time you locate a marker, call a smoothZoom function like so. And implement the smoothZoom function somewhere. And set the initial values of your latitude and longitude variables to wherever you want.